So you’re looking to buy a crepe pan. Well you’ve come to the right place! Crepes, while being both delicious and versatile, can be a bit of a finicky dish. They may just seem like a rather glorified pancake, but without the proper tools, crepes can become unnecessarily difficult. If you’re looking to make the perfect crepe, it all starts with finding the right pan. The product is only as good as the tools you use to make it, right? Lucky for you, the work has been mostly done for you. In this article we’ve outlined the three best crepe pans, as well as the best ‘budget option. Taking the gold medal for the #1 crepe pan is the Cuisinart 10-Inch Crepe Pan. This pan creates that perfect crepe that all of us envision when we think of crepes. Soft, pliable, uniformly browned, and delicious! Apart from producing the perfect crepe, it never loses it’s sleek exterior. It cleans ridiculously easy and, as long as you avoid metal utensils, won’t ever scratch. It has a Quantanium interior and nonstick surface that’s reinforced with titanium. One great thing about this pan is that your crepes absolutely will not stick. You don’t need a spreader or even a spatula if you’re brave enough to try flipping it in the air! Also, there’s no need to feel like you’ll only use this pan when making crepes. This pan is a wonderfully versatile option. For instance, you’ll find that this crepe pan makes the fluffiest eggs! This pan is durable, nontoxic, and oven safe. It also features a tapered edge (i.e. drip-free) and a stainless steel handle that won’t overheat and burn your hand. New to crepe making? Don’t worry! With the Cuisinart crepe pan, you’ll find that it’s even easier to learn on a high quality pan such as this. In fact, very little effort or experience is needed to effectively use this pan. All you need are the desire, a good recipe, and your fine motor skills. Does this pan sound too good to be true? Don’t worry, I won’t lie to you. Unfortunately, the pan isn’t dishwasher safe. Also, apparently just a few people have had some issues with receiving the odd scratched pan after ordering from certain online retailers. This seems to have only happened a few times however. This pan should not be used on an induction stove. Since the pan’s bottom is aluminum and therefore not magnetic, it is incompatible with an induction cooktop. If you try to make crepes in this pan on an induction stove, your crepes won’t cook! I mentioned before that this pan is nontoxic. Given that it is nonstick, it is not PTFE free. It is, however, PFOA free. Remember, using metal utensils on a nonstick pan is almost always a bad idea. Even when the packaging says that it’s ok, it’s normally better to avoid it. Also, keep in mind that this pan is not meant for very high temperatures. Another great thing about the Cuisinart crepe pan is that it is well balanced. The bottom of the pan lays completely flat on the burner without tilting the handle. The pan is about 5/8” tall, and about 1/2” deep. To clean it, all you need is a bit of soap and a sponge. All of the leftovers on the pan will just slide off. This pan comes in both black and silver. Some websites may advertise it as coming with a glass, shatter proof lid, but this is false. This pan don’t come with a lid, neither does it need one. Don’t worry then If you buy this pan expecting a lid and it comes without one. In addition, the Cuisinart 10-Inch Crepe Pan comes with a lifetime warranty. On most online retail sites, this pan has earned nearly a five star rating. As long as you use this pan for what it’s meant for, it will last for plenty of years to come! The Cuisinart Crepe Pan is a worthy and smart investment. Whether you’re after some mouthwatering crepes, fluffy pancakes, or some delicious eggs, this pan won’t let you down. 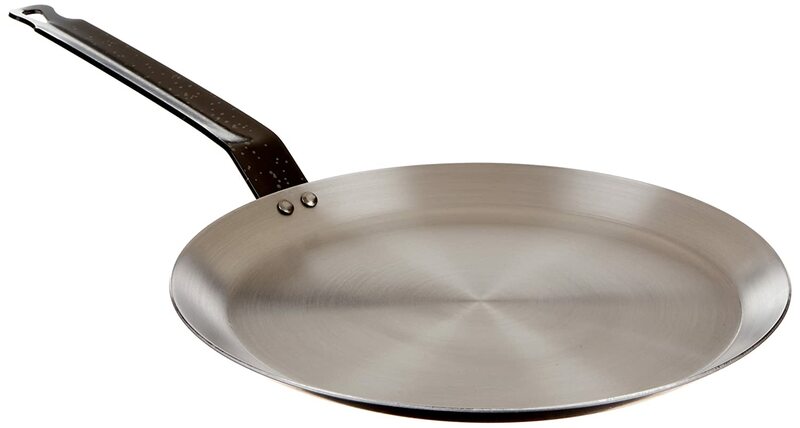 Coming in as a close second, we have the Paderno World Cuisine 10 1/4-Inch Carbon Steel Crepe Pan. Even the name sounds tough, doesn’t it? Well this pan certainly lives up to it’s strong name. This is the Superman of crepe pans; it’s practically bulletproof! It’s made of heavy duty carbon steel which, although sounding the absolute opposite of nonstick, is amazing for crepes! The Paderno crepe pan is 10 1/2 inches in diameter, making about 8 inch crepes. It is heavy duty, durable, and won’t warp! It’s also completely safe to use on an induction stovetop. Feel free to use any type of utensils on it, it’s won’t be scratched or damaged. This beauty is even oven and broiler safe! This pan is about 1/8” thick and about 3/4” deep. To wash your pan, all you need is hot water and a rag. No soap! Afterwards, simply oil the pan! This process protects the finish and prevents oxidation. Eventually, the pan will lose that initial shine, and take on a lovely deep color. This is a good sign! It means that it’s developing a nonstick surface! This will occur after several uses, so don’t worry if you don’t see the deep color right away. Another great aspect of this option is that it’s lightweight and the handle won’t heat up enough to burn your hand. Also, just to be clear, there are no Polymer coatings on this pan. No BPA, teflon, or any other nasty chemical that you don’t want in your food. Just steel! Completely PFOA and PTFE free! Like the option before, this pan is also very versatile! Not only is it great for crepes, but it’s also great for pancakes and eggs! (Omelettes come out incredible!) Don’t worry about that pesky eggs residue that seems to just stick on everything, it will come right off with minimal effort. This becomes even more true as you regularly oil you pan and it becomes more and more nonstick. So what are the downsides to this pan? Well, for one, it’s not dishwasher safe. Also, you have to be willing to take some time to season and care for your pan. Make no mistake, this pan must be properly cared for for it’s full results. Some have given it bad reviews due to it beginning to rust. Remember: This will not happen if you wash it wish just water, dry it immediately, and season it with oil. Even with the few bad reviews, this pan has a four star rating. You will almost undoubtably love the Paderno crepe pan. Not only is it a high quality and reliable product, but it has the looks and style to go along with it. This pan would make a fine addition to any kitchen, whether novice or professional. Here we are at number three! In third place, we have the DeBuyer crepe pan. Even at third place, this pan packs it’s own little punch. Made in France, the DeBuyer crepe pan is both durable and elegant. This pan is the epitome of balance. It’s the third option, but it ranks first in a few aspects as well. Let’s review what those are. What sets this option apart is also that it’s very eco friendly. It’s 100% natural and made up of 99% pure iron and has a natural beeswax finish to avoid oxidation. It’s nontoxic and PTFE/PFOA free. There are absolutely no added chemicals. This pan is a perfect option for those of you whom are concerned with both the environment and your health. What are the benefits of this pan being PTFE/PFOA free? Well, it’s so much better for your health! PTFE’s and PFOA’s are commonly used in a nonstick surface. When a pan gets hot, many of the toxins are released and can be absorbed into your food. Even if your pan is unscratched, the danger can still be present. What are the supposed side affects of these toxins? PFOA as well as many other ingredients in nonstick coatings have been labeled as likely to be carcinogenic to humans according to the Environmental Protection Agency. It’s also possibly related to thyroid disease. Not too savory, huh? Well that’s why DeBuyer has put forth the effort to make a pan that specially caters to people who are concerned about such issues. I mentioned before that this pan also was elegant. It’s true! Not only are these pans made in France, but they also have a sleek, classic French design. 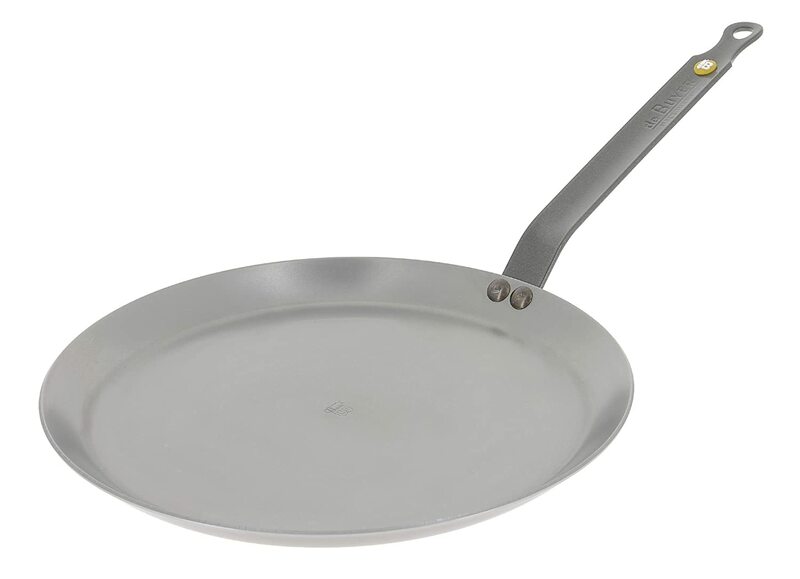 The crepe pan has the classic ‘Lyonnais’ shape as well as the traditional curved handle. These features come together to not only make a beautiful design, but symbolize years of French culinary art. This pan also comes in both silver and grey. The DeBuyer pan has a 11.8” diameter which will make crepes that are about 10.5” in diameter. (The largest crepes on the list) The pan is also 3/4” deep. Feel free to use this crepe pan to also make eggs, pancakes, sausage, tortillas, or even grilled cheese! Thus far, the DeBuyer is the heaviest pan on the list, weighing in at 3.9 pounds. For being third on the list, this pan has the lowest amount of bad reviews. It seem that occasionally people will receive a pan that has a hotspot on it. This occurrence seems to be uncommon however. The other bad reviews mostly result from improper care of the pan. Yes, this pan requires seasoning as well to attain a nonstick surface. So what are the downsides of this product? Well, for one, it’s not dishwasher safe. Also, you have to oil this pan after every use to preserve both the life of the pan as well as your food. This means that it won’t initially be nonstick. Nothing a little butter can’t fix! This crepe pan has nearly a five star rating! Most reviews you can read will state that this pan is durable, efficient, sleek, versatile, and a valuable addition to their kitchen. You don’t even need a spreader to make the crepes. Just tilt the batter around and you’ll have a nice, even crepe in no time. To clean, you don’t need soap! Just deglaze it in hot water! If you have something stuck on it, just rub some corse salt on it. Not only will it scrub it off, but it will also sterilize the pan. Don’t forget to oil it afterwards! This pan, as I’m sure you’ll agree, is very well worth your time and money. I’m sure you, just like the hundreds of other who have bought and reviewed it, will love the DeBuyer crepe pan. So you’ve made it to the budget pick! Do you think you have sacrifice quality for price? Not necessarily! Presenting the Norpro Breakfast/Crepe Pan! With this choice, you can get the sleek functionality of a crepe pan, without the big price tag! If you’re looking to make delicious food on a budget, this pan is the one for you! The Norpro pan is 9.5” in diameter which will make about eight inch crepes. While the crepes won’t come out huge, they’re definitely still big enough for folding! It’s also nonstick which makes for easing cooking! The nonstick coating, however, means that you can’t use metal utensils on it. Try to stick to wooden and nonstick accessories. Another unique feature is that this pan has sloped sides which are optimal for crepe making! The sides make it very easy to move, flip, or even toss your crepe! Your crepes won’t ever stick, and you don’t have to do any oiling to keep the nonstick surface. The short sides make it über easy to get your spatula under even the thinnest of crepes. Because the pan is so thin, it doesn’t take up much space at all! Many would say that as far as size, design, quality and price goes, this pan just can’t be beat! 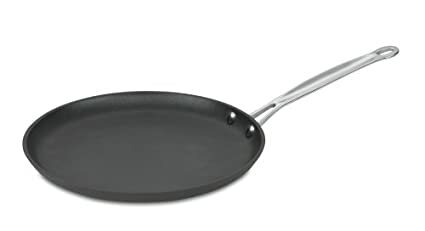 This pan is also great for omelettes, eggs, bacon, sausage, grilled cheese, and some have even used it to make certain types of flatbreads. This pan also makes great pancakes because the batter won’t stick to the nonstick surface! Also, say goodbye to batter splatters! Because it’s so easy to lift the pancake, you don’t have to lift the pancake so high that it splatters when you turn it over. While you can’t use this pan on an induction cooktop, you can safely use it on a glass top or any other stove! Just be reasonable with the temperatures. You don’t need high heat to make any of the aforementioned foods. If you leave it for long periods over very high heat, it may warp. It may surprise you to know that, while it’s the cheapest pan on the list, it maintains a nearly five star rating! This pan is durable, versatile, and a great bang for your buck! While it won’t necessarily break if you put it in the dishwasher, hand washing is recommended. Don’t let the price tag fool you. Although it’s obviously not the type of quality that you find in the other picks, this pan is well made. It’s lightweight, heats up very evenly, and is very easy to clean. The downsides to this pan are than, since it’s of lesser quality, it’s even more important to take very good care of it. Some people have found that if they deviate from the instructions, the pan tends to last for a shorter span of time. Without proper care, the nonstick can possibly peel away. That being said, this pan has been purchased by chefs who say that as long as it’s treated well, you should have no problems with it! You don’t need to worry that this pan will be bad or inefficient for the price you pay. You don’t need to suffer just because you don’t want/can’t drop big money for a pan that you may not use all of the time. This pan is the perfect option for you if you want great results without having to spend too much money. As you have undoubtably seen, all of these pans are great quality for what you’re willing to spend. Take into consideration how often you plan on using the pan. As you may have noticed, the budget choice isn’t too much cheaper than the second pick, so if you plan on using your pan more extensively, perhaps you’d like to invest in a higher quality pan. Another thing you may want to take into consideration is if you’re willing to take the little bit of extra time to take care of your pans. As you may have noticed, most pans need to be oiled regularly to build up a nonstick surface and prevent oxidation. Try to remember that a high quality pan typically only stays that way if you give it high quality treatment. Keep in mind, as well, the material that the pans are made of! As you probably recall, some of these pans don’t work on induction stovetops. Also, depending on the pan, you may not be able to use all types of cooking utensils. Before purchasing a pan, always try to make sure if it fits in with your kitchen. One last thing you may want to think about is the coating on the pans. For some people, this may not make much of a difference. If that is you, then that’s ok! If not however, definitely recheck the listings to make sure that there are no unwanted chemicals or additives in the pan or on the surface. Everyone loves a good crepe. Whether sweet or savory, they’re likely the most likely dish to be a crowd pleaser. Hopefully, with the aid of this article, you’ll be able to make an informed decision about which pan is the best one for yourself.